Virtually everyone has taken a medication at some point in their life whether it's for the occasional headache or for treatment of chronic diseases such as diabetes. When used as directed, medications help to support, maintain and treat countless health problems. Unfortunately, some estimates cite that as many as half of all people don't use medications correctly. Many people will be fortunate and won't suffer ill effects while others compromise their health and may die from improper use, interactions or overdose. For over-the-counter remedies, your pharmacist will be your main contact point for information. Read labels before you leave the pharmacy so that you have ample opportunity to ask the pharmacist any questions. If you plan to take more than one type of medication to treat a condition- or several conditions- check for cautions on the label that warn against mixing the drug with specific foods, beverages or other drugs. 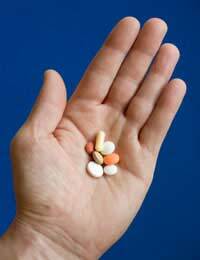 Some drugs can also interact with a pre-existing medical condition. Safe medication use begins before you even pick up your prescription. Be sure to tell your doctor about any dietary supplements or other medications you are taking. If your doctor gives you medication samples, it's particularly vital that you are thorough when explaining anything else you may be taking. A pharmacy offers important checks for drug interactions and when you accept a sample, these can be missed. In your doctor's office, ask as many questions as needed to ensure you know exactly what the medication is treating, how it works and what side effects and cautions you need to follow. It's important that you have a doctor who is open and willing to answer all of your questions. You also need to be honest; if you don't understand something your doctor says regarding medication use, ask him or her to repeat it. It's better to ask several times than have any confusion about how to take your medication. If possible, try to obtain all of your prescriptions from the same pharmacy. This is helpful because a pharmacy usually maintains records and can check for interactions. Read the label and instructions for use at the pharmacy and ask for clarification if you are unsure about use. It can sometimes help to repeat the directions back to the pharmacist so that it's clear you are aware of the label directions. Note any cautions about foods or drinks you must avoid or limit. Also be aware of serious side effects to watch out for-some people feel more secure telling another household member so that he or she can monitor for serious effects. If you have to take your medication at a specific time, consider setting your timer on your mobile, for example, to alert you. It's also wise to be clear on what the medicine looks like so that you don't accidentally take one that appears similar. Don't chew or crush capsules unless advised to do so because this can affect the speed at which the drug takes effect. As with any medication, store it safely in a locked medicine cabinet where children can't gain access. If you have followed the tips so far, you will have reduced the chances of a medication interaction. It's also important that you neither share your medications nor take those intended for someone else. Alcohol is a substance that commonly interacts with drugs and you may wish to avoid it completely, even if the label indicates that minimal use is acceptable. Alternative medicines are often marketed as 'natural,' which can lead people to believe they are completely safe and hold no potential for harm. Don't assume that because something is natural, it is not a threat to your health. Your doctor needs to know about any alternative treatments you are taking that could interact with a drug. Antibiotics treat bacterial infections but due to overuse, antibiotic resistant bacteria have become a threat. Overuse can occur when a doctor prescribes an antibiotic without confirming that the infection is a bacterial one. It also occurs when you don't take your antibiotics for the directed time duration and are then forced to complete another course. It can be easy to stop taking the antibiotic when you start to feel better and your symptoms disappear, but it's important that you continue to take them for the full directed course. This will ensure that the infection has been sufficiently treated and it can help you avoid another round of antibiotics. Your health may be complicated enough without having additional complications from unsafe and improper medication use. Follow the tips for safe medication use and you can help to prevent the uncomfortable or dangerous health problems that may occur. Medicines are a part of life for many people and safe use means that you maximise medication benefits while minimising risks. A Medicines from What's in Your Garden?